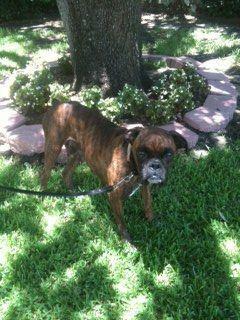 Meet pretty Alouette, a new foster here at LBR. Her foster mom took her to the store today for a pretty new collar and happened to pick up a new toy for her. Well, Alouette just loved it! She took it around to show off to all the other dogs, nubbin wagging the whole time, then gave it a good bath and settled down for a nap with it. I love seeing foster dogs learn what the good life is all about! Ladies, you might need to avert your eyes. Look at that nekkid boy! Ha hah, poor Denmark. Denny had his surgery yesterday, so they shaved him nearly bald. That poor guy. He still is in a pretty good mood, though. I know he's going to feel a lot better now! All right, I want some cooler weather down here right now -- or the bear gets it! I am on strike. It's 104 degrees today. Did you hear that? ONE HUNDRED AND FOUR!!! This is ridiculous. It's miserable. It's dog abuse! I demand a private air-conditioned pod for my daily walks and potty breaks. With something to protect my poor paws from that hot pavement! At least LBR foster May has found a way to keep cool. AHEM, Mom, where is mine?! Well, if your mom is as cruel as mine and refuses to buy you an air-conditioned pod or private pool, just try to stay cool. 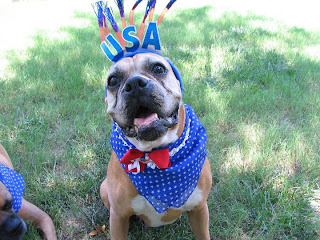 Remember, short-snouted dogs like boxers and bulldogs can't handle the heat very well! It starts to get really hard to breath when it's too hot. Be sure that your human only takes you on walks early in the morning or late in the evening when it's a little cooler (hah, around here that's still 85! ), and don't stay out in the backyard for too long at a time. 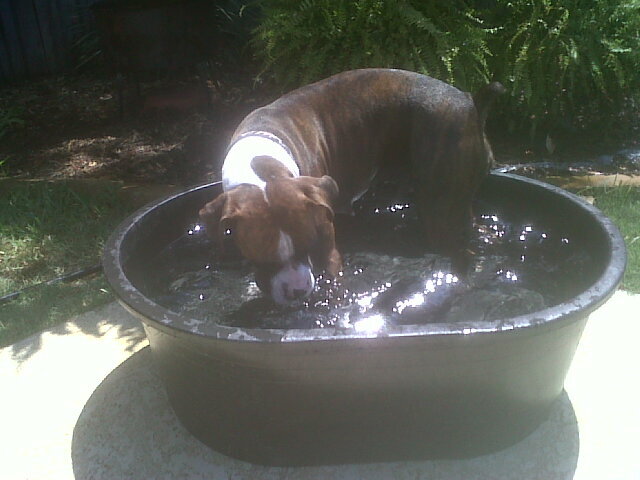 Even if you don't get an awesome pool like May's, remember to drink lots of water too! What? Stop snowing! Man, a dog can never get a break around here. LBR alum Olivia would like to give a big kiss to Legacy for helping her find her furever home, and thanks to all the people who've supported our new fundraiser for the gimpy babies' surgeries! We've raised over $3,000 so far, which is fantastic! But since our goal is $9,000, that means we still have a long way to go. 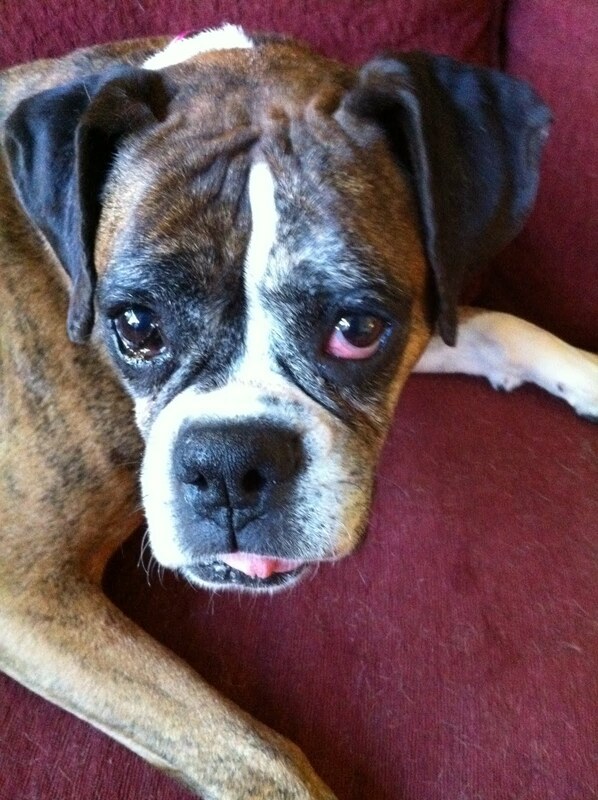 Please go to www.savetheboxers.com/donate.php to make a contribution. Even if you can only spare a couple of dollars, it all adds up! Ugh, I see why humans are always talking about those green papers. They're so hard to get, but you need them for everything!! Right now LBR is really in need of a lot of green papers to help not one, not two, but five of our dogs that need surgery. It's called or-tho-ped-ic surgery, which means it's to help their bones. Poor babies! Denmark is ashamed that he's the first of our babies who needs help. 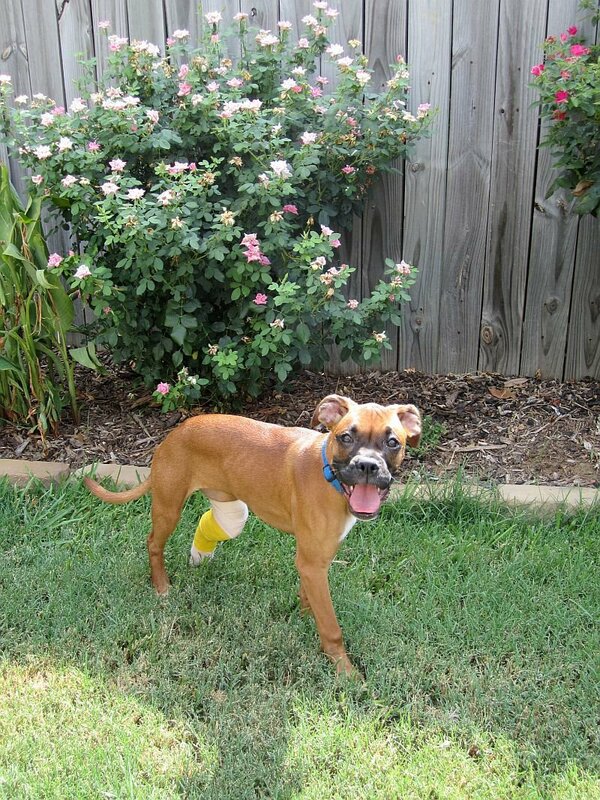 He has a torn cruciate ligament, and his surgery will be $2,000 - 2,300. Look at this cute face! Pippi (because she's got a long stocking, see?) fell a long way and broke both of the bones in her back leg. It was a really nasty break, with the bones actually poking through the skin. Owwww! 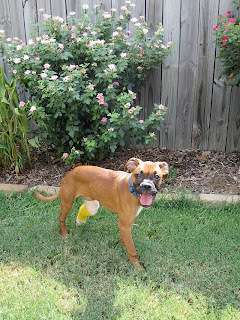 We're not sure how much her surgery will be, but another dog with a similar issue cost us about $2,600. Look at handsome Walker! He came to us with a nasty injury that basically took all the skin off his leg! We didn't know that he also broke his foot, and now he has some pieces of bone floating around that have to get chased down and taken out. 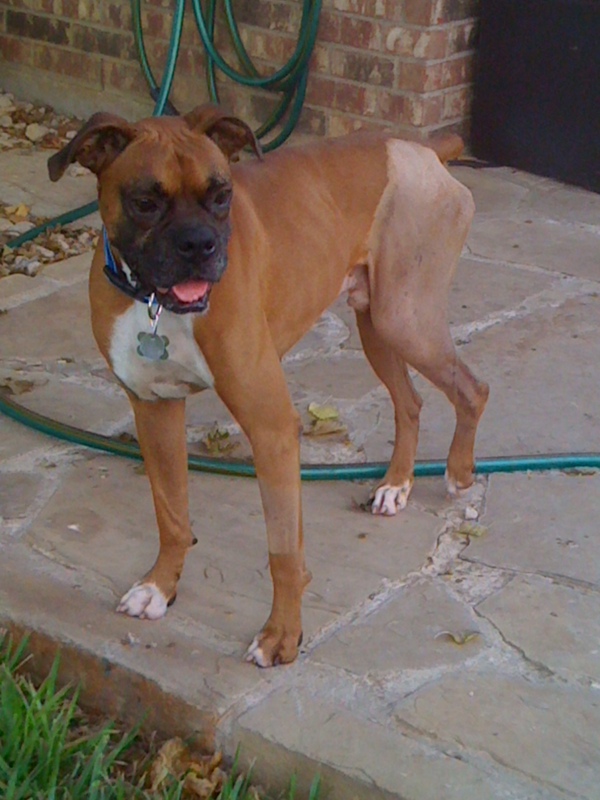 His surgery will run around $2,500. Lark is relieved that she isn't the most expensive of the group. At a mere $800-1,000, she's almost cheap! 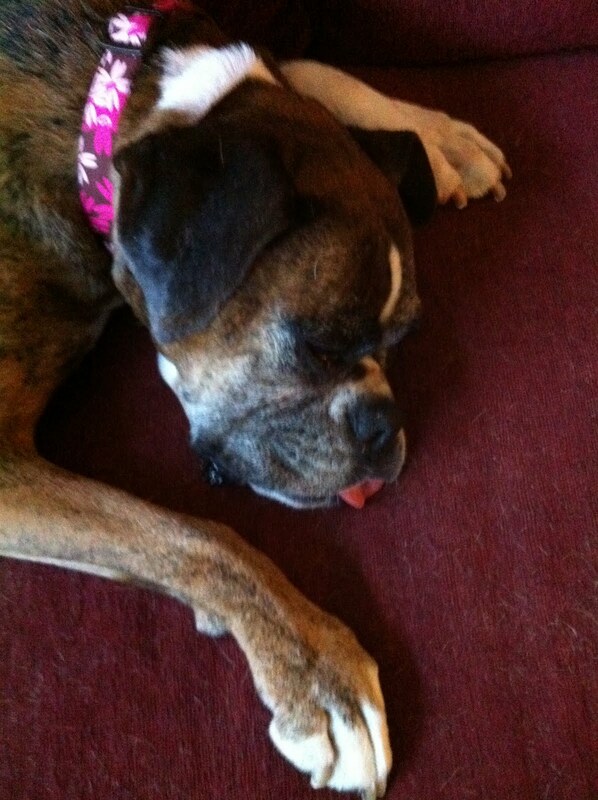 But she needs surgery to fix a dislocated hip. She was used as a breeding machine and then dumped, and her hip was out long enough that it can't just be popped back into place. Ow! Finally there's handsome Beckham, who says he can be a soccer star if he can just get his old hip injury repaired. That's another $800-1,000. All told, these babies mean Legacy is facing around $9,000 in surgery bills. That's a huuuuuge chunk of our budget, and we could really use some help. If you have even a few dollars to spare, please go to Legacy Boxer Rescue to donate. Every little bit helps! And if you don't have anything to spare, please at least send up some good thoughts and prayers for these 5 babies that their surgeries go well and they don't have any other problems! They really appreciate the support. Mom's crying too much to type very well, so this will be a short post. 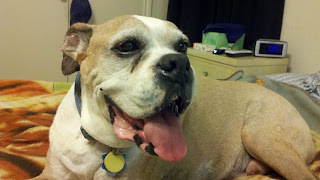 My good friend Cubby, fellow contributor on this blog and blogger of Cubby Goes Digital, passed away yesterday. 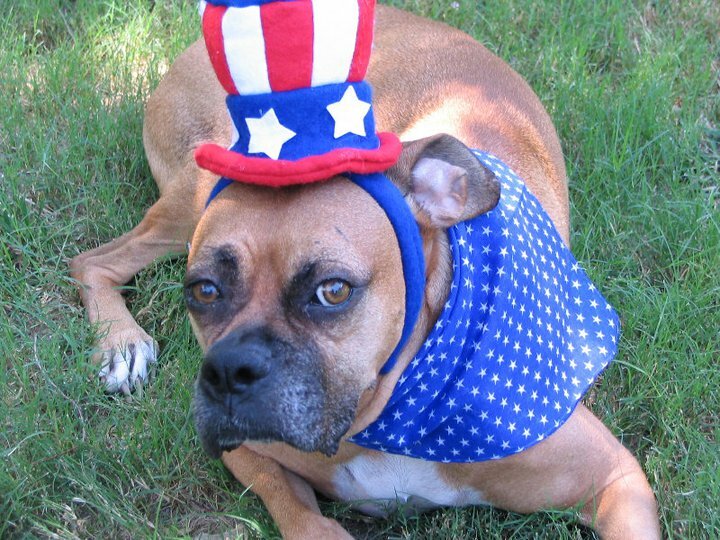 He taught me everything I know about being a boxer ambassador. He did so much wonderful work for LBR. We all have a very big hole in our hearts right now. Please stop by his blog and post a message of support for his moms and sissy Dakota. They miss him very much, as do we all at LBR! My poor foster sister isn't feeling well right now. She had to go to the V-E-T yesterday and have some nasty lumps removed. 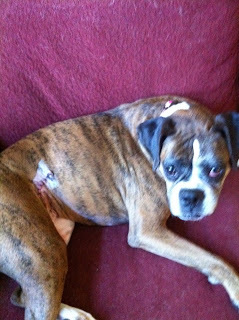 (We boxers are really prone to that yucky cancer stuff, so we have to remove lumps quickly to check them out!) She was gone aaaaaall day, and when she came home she just wanted to lie on the couch. Mom thought she looked kind of pathetic. You can kind of see the stitches on her side. She also has two more sets on the other side, on her back leg. Poor thing. :\ Mom isn't letting her go on walks with us for a few days either, and Vivian doesn't like that at all! That would be LBR alum Stevie at the top and foster girls Cupcake and Miss Demeanor. Who wouldn't want those sweet girls for their own?? Vivian is a beautiful 5-year-old boxer gal who is an absolute snugglebug. Seriously, she likes nothing better than to snuggle all the time, whether it's with Mom or me and Cinderella or random visitors. She loves to cuddle. She also loves to play! We were all fast friends within about five minutes of her showing up at the house. She's never met a dog she doesn't love, and she's been around lots of dogs of different personalities. 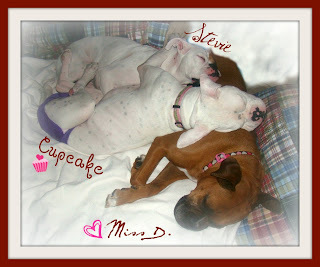 We play and play and play, then collapse and all snuggle together until we're ready to play play play some more. Vivian's also good with the kitties that live here. She completely ignores them, which made Mom really happy. 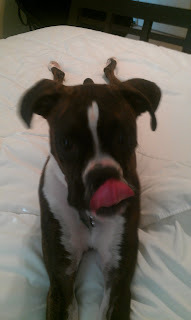 Oh, and she's what we call a "pocket boxer" -- she's a tiny little thing (about 40 pounds!) that would fit in your pocket. Everyone who meets her starts cooing "oh aren't you so cuuuuuute!" Yeah, yeah, yeah, we're all cute, we get it. It's hard having such admiring fans. Vivian loves hanging out with us, but she told me that what she wants more than anything is a furever home with a mom or dad of her very own. Other dogs or on her own, with cats or kids or whatever -- she just wants to be loved! 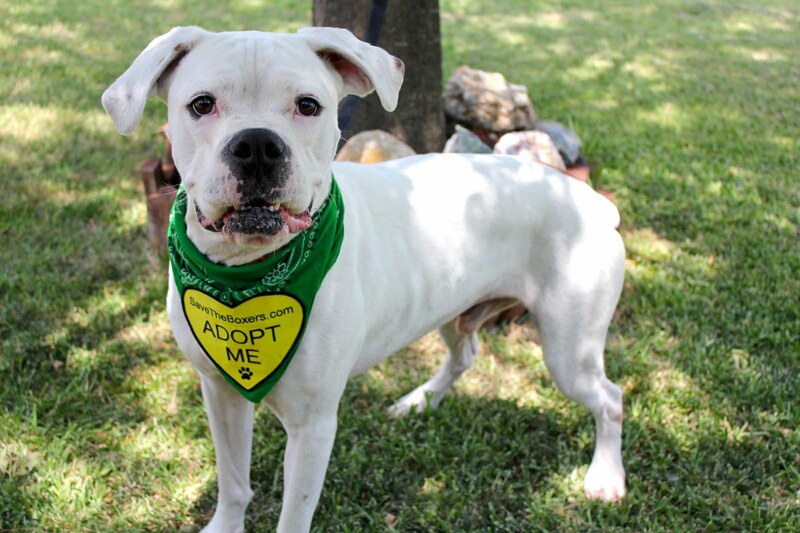 Go fill out an application at Legacy Boxer Rescue today and let them know you want VIVIAN to be your very own love-bug. 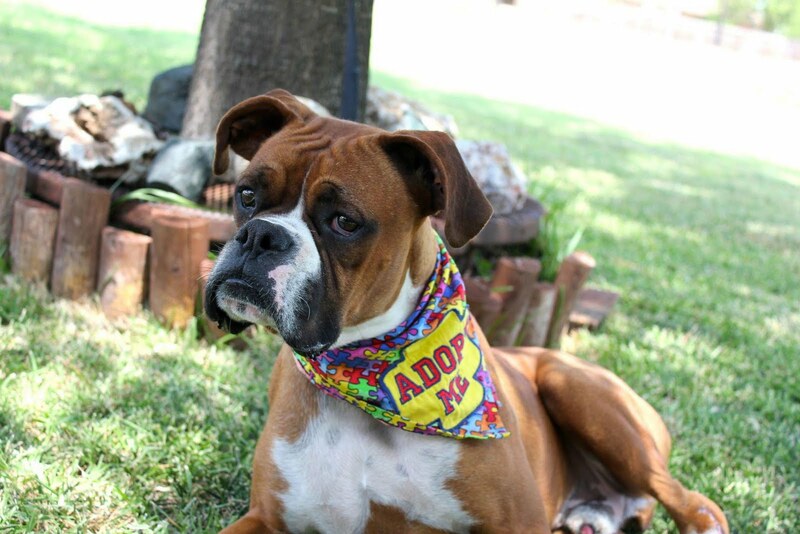 Alabama first came to our attention hear at LBR when she was a scared soon-to-be mama waiting in a shelter. She had a gorgeous litter of LBR puppies, the All-Stars! Here's one of them all grown up, Borg. Doesn't Bama grow them handsome?? 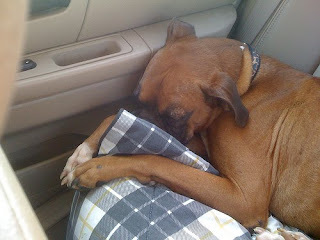 Nowadays Bama and her brother Zeke keep their paws busy by helping their dad run Chez Grandjean, a very busy LBR hotel! They have all sorts of foster dogs there, some long-term and some babysitting. Phew, I'm tired just looking after one! We're very happy to have Alabama join us here with her own fun perspective on LBR events. So everyone give her a great big Blogville welcome! 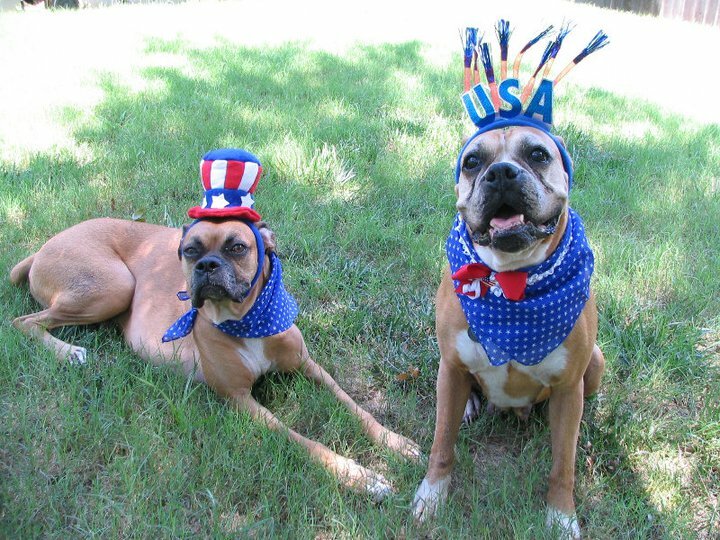 My sister Cinderella and I would like to take a moment to wish everyone a very happy Fourth of July. As you can see, we love getting into the spirit. A special salute to all our brave soldiers, past and present, who've sacrificed so much to give us the freedom we celebrate today. Now bring on the hot dogs, it's time to paw-ty! !